You know you need a website for your real estate business. There is no question about that. The problem is that you don't know the first damn thing about designing and building real estate websites that are powerful enough to convert your leads. Odds are you already have (or are currently working on getting) a real estate website for your residential or commercial business. The problem is that you probably don’t know the first damn thing about creating a real estate website that is stunning, functional, and insanely powerful at converting leads. You have probably spent hours pinning articles and watching videos trying to figure out how to create a website or what service you should hire to create and manage one for you. There is so much information out there and such a wide variety of varying opinions on the best way to go, that it becomes overwhelming quickly. It probably makes you want to throw your hands in the air and just give up on the whole thing. With more than 80% of buyers and sellers searching for real estate agents online, it is more crucial and valuable than ever before to have a profitable real estate website. 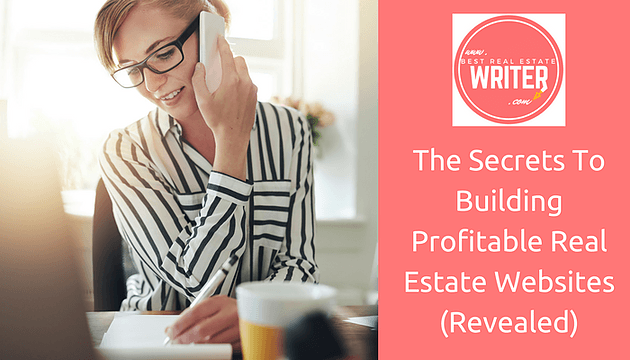 Profitable real estate websites have become the holy grail of the real estate industry because when done correctly, they can make you a fortune both during, and at the end of your real estate career. Many real estate agents have discovered that when they invest in building a valuable website, they can sell their site when they retire for five or six figures. Although it is true that you can crush your competition with a properly designed website, it can feel impossible to know what causes one real estate website to be lucrative over another. That’s why today I am going to share with you the same secrets I share with all of my clients as I coach them to achieving a profitable real estate website. These secrets have been successfully implemented by real estate agents all over the United States to increase their lead generation, convert far more leads than Zillow, and actually sell their websites for major mulah. These are some of the secrets that my clients pay top-dollar for, but today I am going to share them with all of you in the hopes that you understand why it is important to invest in your website and why some agents are killing their competition online. The first thing you need when starting any website is a series of strategic domain names to point to your site. This is the first place that many real estate agents make huge mistakes. Many agents unwittingly select domain names that include their own name thinking it is a smart personal branding move. Wrong. Since you are running a locally-centric business as a real estate agent, it makes the most sense to use your location in your domain name. This way, when people are searching for real estate in Buffalo, Google will recognize your domain name as being a relevant link to display. It is important that your domain not only communicates what you do, but also helps you rank for key search terms that are relevant to buyers and sellers in your area. There are tons of providers out there but I am a long-time fan of BlueHost and I suggest you get all of your domains from them like I do. Regularly publishing fresh, custom-tailored, evergreen content to your website is, and should always be, the number one priority you have in marketing and branding your real estate business. The content that you publish on your website and blog is not only one of the most influential tools at your disposal, it is also the reason that Google will point people to your website. My clients get to witness every day the overwhelming power that fresh and evergreen content can have on a real estate business. It is important that the content you create is designed to speak directly to your ideal clients and offers them an overwhelming amount of value. If you want your prospects to view you as a credible real estate expert, you need a huge library of content on your blog and website that will teach them anything and everything that they could ever want to know about real estate and the community in which you sell it. This means having pages on your site that highlight every nook and cranny of the area in which you sell real estate. It also means having a blog, free downloads, and books that teach your prospects and clients about every aspect of buying and selling properties in your target market. Every market is different, which means the clients are different. If a first-time home buyer is trying to learn about the ins and outs of buying her first house in a rural area, she wouldn't want to hear advice that pertains to people trying to buy in a city. Ask yourself who your ideal clients are, what their problems are, and what their goals are. Create disproportionate amounts of content that speaks to those issues and publish it on your website, then share it to your social media to grow your organic traffic. Creating and implementing an effective lead capture device on your website is important because it shows you who is interested in and engaging with the content on your website, whether it be your blog, properties, or any other component. There are several different types of lead capture devices that you can implement on your website, depending on what you are trying to accomplish. Some of the most effective lead captures offer a free tool or gift in exchange for the visitor providing their name and email address. Free e-books and courses are two of the most effective lead capture tools you can offer in exchange for your prospects’ personal information. Some agents choose to implement a lead capture as a condition for being able to browse homes. This method has been very effective for some. However, remember that it could cause people to bounce off of your site and go to someone else’s if they are unwilling to provide their email. It is no secret that you need to have a website that is mobile-friendly. Yet many agents are still prioritizing the desktop versions of their website above the mobile versions. This mistake could be fatal. Marketing experts like Gary Vee are predicting that most desktop versions of websites are about to start disappearing as more and more people spend the majority of their time surfing the web on their phones and tablets. Therefore, it is essential that you are investing in a mobile friendly real estate website that will not just look beautiful, but will be fully functional. Visitors to your site should be able to enjoy your blog, chat live with you, and explore properties with ease on the mobile version of your website. Not only are the majority of browsers searching the web from a mobile device, but those that are searching using their phones and tablets behave differently. They tend to absorb higher levels of content, especially visual content like images and videos. This is why apps like SnapChat and Instagram have become so successful. That means that you need to be incorporating a lot of visuals into your website. One of the best ways to do this is to convert your blog posts into videos. You can learn how to do that quickly and easily while turning yourself into a YouTube Rockstar here. "Real Estate Listing Descriptions | Listing Descriptions That Sell - Sarah Layton Writing listing descriptions that sell is an art and a science. Whether you are a real estate agent, property manager, vacation rental specialist, or you are trying to sell your house yourself, I will write a powerful listing description that will make the property come alive. Mobile users also buy more. A lot more in fact. Studies show that the buying behavior of mobile users is on average, more than double, than that of their desktop counterparts. The gods at Google have also been favoring mobile-friendly sites for quite some time now, so if you are trying to increase your organic traffic, you have no choice but to have a mobile site. If you fail to do this, the newest Google algorithms with actually punish you for not meeting their standards of what they consider a mobile-friendly site. IDX stands for internet data exchange. It is the integration tool that pulls the current listings from the MLS and displays them on your website. I am sure that I don't have to explain to you why it is valuable for people to be able to explore available listings from your website. But what I do want you to consider is how you can be creative and strategic in the way that you use IDX to showcase listings. Let's say that you are writing an article for your real estate blog about things to consider when buying a farm in Dutchess County, New York. You should be utilizing your IDX to import current farm properties from the MLS to be displayed strategically within the same page as that article. Or at the very least, there should be links that would allow the reader to do so, without ever leaving your site. At this stage in the game, consumers aren't impressed by you having IDX on their website. So if you are trying to sell them on buying or selling with you, don't shoo them away to sites like Zillow to find the information they are looking for. Use your IDX integration as just one of the many tools in your toolkit to position yourself as the local expert on all things real estate and beyond. Testimonials and social proof are extremely helpful in convincing your prospects that you are the badass agent that they simply can't live without when they get ready to buy or sell. However, so many of you still fail to implement them on your websites. Even when you do, you don't seem to do so in a way that shows planning and consideration the way I would want you to. Rather than just shoving a couple of testimonials in a random spot on your website, why not place them carefully in order to leverage them for all they are worth? For example, if you have a page that is solely dedicated to first-time home buyers, any reviews that you have from first-time buyers you have worked with in the past should be featured on that page. People want to know that you are capable of helping people that are like them. Sellers want an expert on listings, and buyers want an expert on the buying process. You can be both by correctly applying your reviews and testimonials throughout your real estate website. So there you have it. These are some of the biggest "secrets" I tell all of the top-producing real estate agents across the United States that hire me to coach them on building their brand and business through the modern miracle that is content marketing. Are you going to stop what you're doing after reading this article and start making moves to make your real estate website powerful and profitable? Or are you just going to go on about your merry way and let your competition crush you because they care enough about their business to make these changes? Real Estate Email Marketing | Real Estate Email Campaigns | Sarah Layton Every marketing professional under the sun will tell you that real estate drip campaigns are one of the most efficient, effective, and powerful ways to take your leads from cold to closed.